Are you going on a trip and you just don’t know what to do with all of your favorite essential oils; those oils you just can’t live without? What you need is an essential oil carrying case. I discovered the answer when I was faced with the same issue. I needed something to pack in my suitcase for long trips to California, that would keep the essential oil bottles from breaking. I found the pureGLO 16 Bottle Essential Oil Carrying Case. This case is a necessity if you’re traveling and need something to carry your essential oils in. Read my review below and find out more about it. It just might be what you’re looking for. I was concerned about how to safely travel with my essential oils. After all, they are essential! This carrying case protects those precious oils so that they can safely travel to your destination without breakage of the bottles. It can safely be tucked away in your checked baggage and the bottles arrive intact. When we go away for the weekend, we just put our bottles in, zip it up and away we go. And when we get to our destination, it makes nice storage for the bottles. Essential oils should be kept in a dark place and this keeps that light out, so the oils will not be affected by the light. It makes a nice storage case for home use, too. If you use essential oils at work to diffuse in your office, and need something to carry them back and forth this is the case you should use. It has a convenient handle to grab, so they can be carried without concern of being dropped. Measurements: 6.3 x 6.3 x 2.8 inches. This carrying case is made of strong fabric shell, with a top handle for easy carrying while keeping all the bottles upright. There is a foam insert to keep all the bottles safe and separate. The insert holds 16 bottles of sizes 5, 10 and 15 mls. It actually will hold my 30 ml bottle as well, which is nice because that’s the size I tend to buy more frequently. It has a very well-constructed, sturdy double zipper, which makes it very easy to get the case open. Inside the case on the lid is a pocket that will hold small essential oil supplies. Is This Carrying Case Right For You? 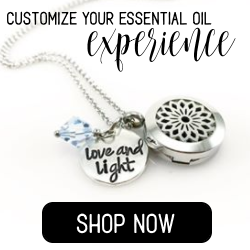 If you are an essential oil lover, and are looking for something to carry your oils in, this would be perfect for you. If you need a good storage case for your oils, this case will work for you. Essential oils keep best when they are stored in a dark place. This case has a black lining that keeps the case dark when closed up and does the job. It will work for the beginner and expert alike. The pureGLO Essential Oil Carrying Case is quite the handy case, and it can be found on Amazon at a reasonable price. It comes in black. This was previously sold by another seller and the average star rating was 4.5 out of 155 people. That’s a pretty good rating. There are several things about this case that I really like. First of all, the handle is so convenient when you are transporting the case. Just grab it up and go. The case can be moved in and out of suitcases easily with the handle. Then there is the protection you have with the foam. The bottles won’t clank together with a chance of breaking. The foam keeps them separated and upright. Most size bottles fit it in the foam holes quite nicely. The bigger the bottle, the snugger the fit. I was really pleased when I tried putting my 30 ml bottles in it and they fit! The 5 ml bottles don’t fit quite as snug as the others. They are shorter than the top of the foam also, but they can not fall over and will stay upright and in place. This foam is also removable so it can be taken out and used without the foam, but that would not be advisable as the bottles would have no protection. There are some drawbacks with this case. The material of the case is very strong and durable, but there is not much protection for the bottom. The same with the top of the case. The foam that holds the bottles is nice. It keeps the bottles protected, but it needs to have foam on the bottom of the case and also the top for added protection. Colors being offered are black, purple and light purple. I got the purple and it is so dark it looks almost black. This was a complaint about the case on Amazon, but I failed to read all the reviews. Had I done that, I would have purchased the light purple. It would be nice to have more color options and/or design. For future reference, when purchasing on Amazon, it is important to read the reviews and then make an informed decision. If you want something more colorful, I would recommend this essential oil carrying case, which has the same review rating as the pureGLO, but offers more color selections. If you are looking for something bigger, this 30 essential oil carrying case might be for you. This has room for 30 bottles and is actually a hard case. It also has the same review rating as the pureGLO carrying case. This case was previously sold by another seller on Amazon. At the time I bought this carrying case, the Amazon review was 4.5 out of 5 only because of the protection issue and the color. I am very pleased with this case despite those issues. It serves its purpose quite well. It is a very good option for transporting your essential oils. If you are looking for a carrying case for your oils, I would recommend the pureGLO 16 Bottle Essential Oil Carrying Case. It is reasonably priced, and has free shipping. Buy it HERE. If this review was helpful and you have a question, or you’ve purchased this carrying case, please leave me a comment and let me know what you think. ⟵What About Lavender Oil? – A Way To Relax…And More! Fantastic article. I was searching the web for one of these for my wife. Every time we travel all the oils must come and it’s a chore just to watch here try to pack them just right. I will definitely get brownie points for this. Yes, it is such a chore trying to get them packed. Once I found this case, now it’s a breeze. I’m glad you liked this review and hope it helped get you those brownie points!! And I’m glad to hear your wife uses essential oils.. Thanks for reading and come back again!! I know that I have been starting to dabble in essential oils and the benefits they provide. My favourite is eucalyptus! Great idea to outline the best carrying case for them all too! You picked a great oil for your favorite!!! The properties in it make it a good natural antiseptic. It is anti-fungal, anti-inflammatory, antiviral and anti-bacterial. Since it’s your favorite, you probably already know this. What do you use the eucalyptus for? Are you using any other oils? I’m interested to know. Thanks for reading my review. Glad you enjoyed it. Come back again, ok? I agree, Essential oils are totally essential! I have had to choose my favorite sleeping oil and wrap it in bubble wrap and hope that it made it safe…. so that I could sleep on vacation. This bag is just what I need! Thank you for sharing. When you wrapped it in bubble wrap, did it make the trip safely? What’s your favorite sleeping oil? Lavender? With this case, you wouldn’t have to worry about that anymore. It really is a nice bag. I love it!! Thank you for reading! Come back soon! I love to use essential oils. I make almost all my beauty and skincare products as well as soap. EOs go in everything. There are some that are incredibly expensive that I wouldn’t even dream of carrying outside of my home like chamomile and helichrysum. With one of these cases, I might be able to. You mentioned that the pureGLO case doesn’t have protection on the bottom. Do you know if the other cases you mentioned would? Wow! !I haven’t been brave enough to make skincare products or soap yet. Sounds like you have quite a collection of oils. As far as the cases, the smaller one I really am not sure about. It sounds like it would be pretty sturdy, with velvety material. The bigger one is a hard case so it would have protection. Here is a thought for any of them. I haven’t tried this yet, but I am thinking about doing it to have that extra protection. Use a piece of strong cardboard to line the bottom of the case. It would give it extra protection and make it sturdier. It’s something to consider. Thanks for reading the review and you can see that you have options to carry even your expensive oils with you. Actually I think this is an awesome container, but not necessarily for travelling, but rather storing. See, my wife had a few essential oils and we had them on the dresser, but not in a case like this. We have dogs and kids and needless to say, both knocking into the dresser running around the house and broke these. It wasn’t a fun clean up process. But this case looks really well put together with the foam insert that actually keeps the jars separate and not able to knock/bang into one another. I also like that it’s padded, so if it does get knocked over by a kid playing a game of tag with fido, well, it looks like it could withstand it. Thanks for sharing that experience. Things like that happen when you have kids, and especially when you add dogs to the mix. Yes, the case makes a good storage case, too. I’m pretty sure if they had been in this case they would not have broken. There is actually no where for them to go once they are in the foam holder. Plus the darkness of the case helps the life of the oils. I’m curious how your wife uses the oils. Just for diffusing? Or Topically also? I’m glad you liked the review. Thanks for reading. Wow such a great product. It makes it so easy to take wherever. I usually put my bottles between the cloths, so it won’t break but this seems a lot better! Yes, it really is a great product. It’s very convenient. You just put your favorite oils in and go. The foam gives it great protection. Plus they stay upright, which is good. Which oils do you have and what do you use them for? I’m gradually adding to my collection. I use mine mostly for allergies, respiratory issues and anxiety and stress. Thanks for reading the review. I’m glad you like it. You might want to consider getting one of these cases so you don’t have to use cloths anymore. I should get one of those! So glad you stopped in and read my post. Yes, that’s what I use to do too until I found this case. Now, I just put them in the case, zip it up and pack it in my suitcase. Although, to be on the safe side, I do put the case in a plastic ziploc bag when I’m flying. I probably don’t need to but just in case I don’t have a lid on tight or something. It does fit perfectly in a gallon ziploc bag. And, yes, you should get one. It’s better than wrapping them all up. Oh, and I’m just curious, what kind of oils you use? Thanks for reading and come back again!